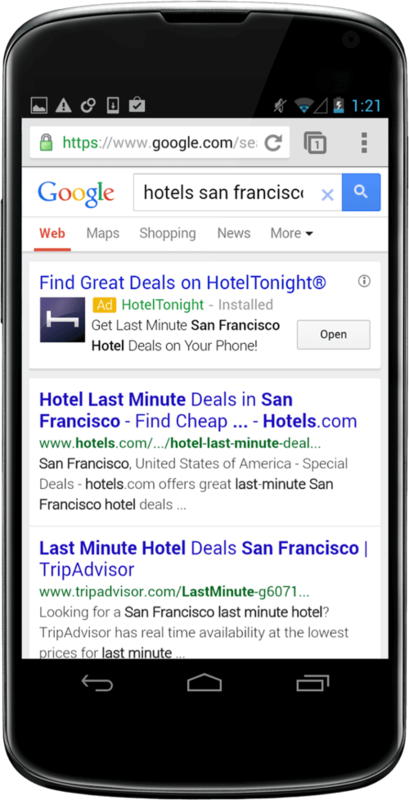 You’ll soon be seeing mobile ads from Google that can take you directly into an app. These ads will appear in Google’s mobile search, on YouTube, and on third-party websites that use Google’s ad network. Today the company announced it will offer ads that display a button that will open up the advertiser’s app for more information. If users don’t have the app installed, it will prompt them to download it. Known as deep linking, this technique will take you directly to specific information in an app. Similar to other advertisements Google offers, these deep linked ads will use your personal data—such as which apps you frequently use and the types of in-app purchases you make—to serve up tailored app install suggestions. “If you exercise regularly and use an app to measure how far you run, you might see an ad for an app that helps you measure the foods you eat and calories consumed,” the company said in a blog post. App install ads have proven hugely successful for Google since it launched them in 2011. Both Twitter and Yahoo have begun using app install ads as well. Correction, 1:15 pm PT:An earlier version of this story incorrectly stated that Google was unveiling app install ads, which it has offered since 2011. The new ad product it launched today features deep linking.